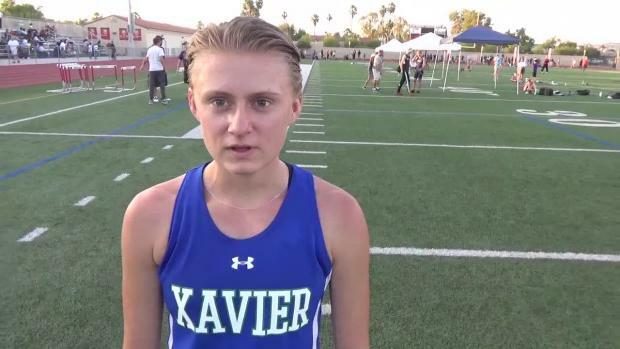 Sarah Carter graduates from Xavier with a cross-country State Title, and two silver medals for 1600 and 3200 from this year's track and field State Champs. 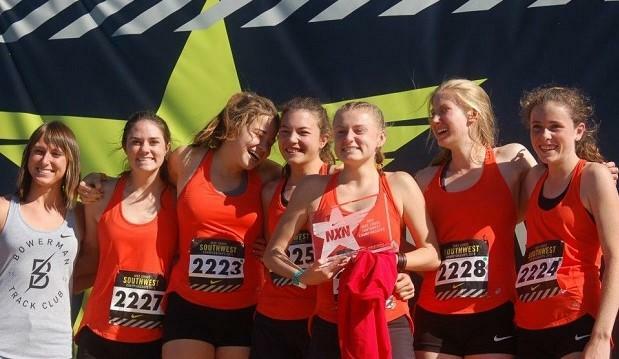 From 2015 to 2016, Sarah went from finishing 57th at the cross-country State Championships to winning the State Title. This season she was ranked no. 2 in Arizona for 3200 and finished the season with a PR of 4:53.07 and a no. 3 ranking for 1600. 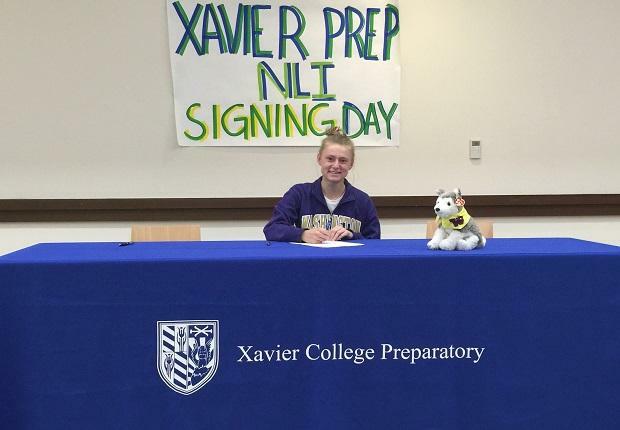 Sarah has signed with the University of Washington and will compete for the Huskies. My most memorable race would have to be cross country state my sophomore year, which happened to be one of the worst races of my life. I placed more than 30 positions behind where I was seeded, letting down both my team and myself. More than anything, it was a motivating experience that inspired me to change as both an athlete and person. That failure made me want success more than any good race or workout ever could. While the state has been full of some amazing competitors over the past four years, I would have to say that my biggest competition has been myself. I have struggled with a lot of self-confidence issues, and overcoming them has been a big part of making me the runner and person I am today. If possible, I would like to go back and remind myself to run every day like it could be my last. Not giving my absolute best effort in every single one of my races has been my biggest regret, especially in seasons where I struggled with injury. Personally, I have dealt with both physical and mental struggles including both issues with injury and self-belief. Maintaining a positive attitude and faith in my abilities while being forced to watch important races from the sidelines was difficult at times, but losing those opportunities has taught me to find more value in every moment. 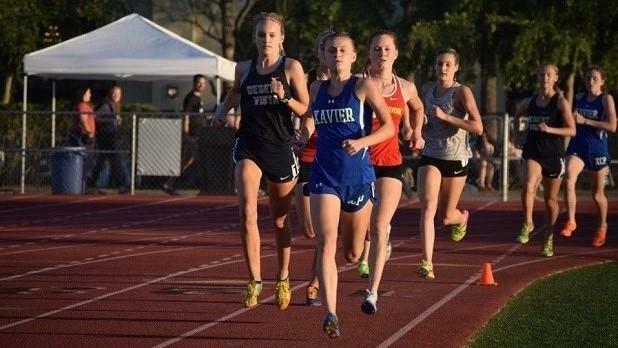 What will you miss the most about running for Xavier? Being a part of the Xavier team has been a fantastic experience, and I am more than thankful for the past four years. I am especially going to miss spending time with my teammates at our post long run brunches where we consume sickening amounts of pancakes and laugh about our favorite Coach Van moments. What advice would you give to the incoming Xavier Gators? Being an athlete at Xavier will be one of the most challenging and rewarding experiences of your life. Getting up for 5 am practices is not as difficult as it sounds (I promise), and it will feel great to start your day with a workout under your belt. While doing some of your homework in the locker room before school is inevitable, time management is key; you'll definitely have to learn how to balance the Xavier workload and running. Don't be afraid to work hard, have fun, or go to homeroom makeup-free with your hair soaking wet from the showers. What influence have the Xavier coaches had with respect to your performance and overall life goals? Coach Van Sickle has been a huge part of my life for the past eight years, beginning with Go the Distance track club in 2009. While we've had our ups and downs, he understands me as a runner better than anyone. Coach Vito has always been a major source of encouragement, especially at some of the more difficult times in my high school career. Coach Higgins is most definitely the team mom, and is always there to provide support, fantastic hair-braiding, and emergency banana bread. You've signed to attend the University of Washington and will run with the Huskies. Have you decided on a major? I'm more than excited to be a part of the UW team, and plan on double majoring in Bioresource Science & Engineering and Environmental Science & Terrestrial Resource Management. There are countless people who have contributed to getting me to where I am today, namely my coaches at Xavier: Coaches Van Sickle, Vito, and Higgins, as well as my amazing teammates. I would also like to thank my family and friends for putting up with my hectic schedule and (often) stressed out self. A huge thank you also goes out to the coaches, staff, and athletes at Team Prep USA, who showed me that the best possible thing I can be is myself. I feel beyond blessed to have been able to compete for the past four years, and am thankful for all that God has given me, including an incredible group of teammates and competitors, supportive coaches and friends, and the ability to be passionate about running every day.